A now getting popular cold water resort, formerly called Piit resort in Pangil, Laguna, once visited by Tutubi many moons ago, got much development and funding from the World bank, yet managed to preserve the pristine state of Panguil River, fed by Ambon-ambon Falls upstream, and empties into Laguna de Bay. 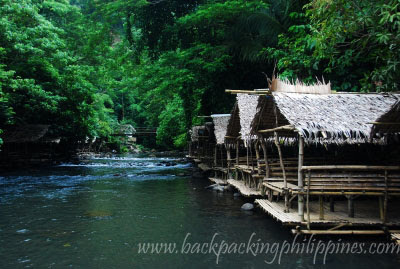 Several times Tutubi wanted to re-visit the now developed Piit Resort, the chance came with a rare time his entire family was complete in Paete, Laguna and where the plan to visit Pangil River Eco-park (Piit Resort) became a reality. Tutubi and his family arrived at Piit Resort around 11am, on several tricycles (PhP80.00 per tricycle), and left shortly around 1pm, barely enough time to wander around, take pictures but too focused on his "mini-me" frolicking on the cold water of the nature resort surrounded with lush greens, trees, birds and butterflies from Sierra Madre mountain range. 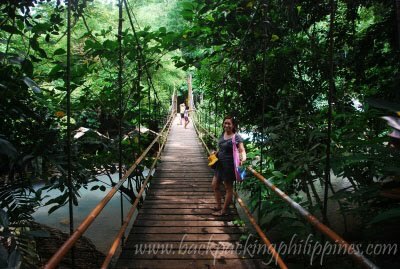 Panguil River Eco-park has a ncie receiving area, clean restrooms, a 20 meter hanging bridge, kiddie swimming pool, a dam/spillway, cottages for rent, a gazebo for events (e.g. weddings, debut), a one kilometer trail to Ambon-ambon Falls (Tutubi intends to visit this next summer), camp sites and a police station nearby. Other activities besides swimming, and family picnic includes white water river tubing (using car wheel interiors to drift on the white water of Panguil River). 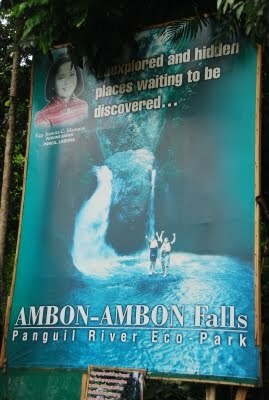 Next summer, a visit to Ambon-ambon falls is in the offing. There's also a hidden falls there while neighboring Famy and Siniloan towns get the most attention from mountaineers and mountain climbers due to the presence of five waterfalls of Mt. Romelo including Buruwisan, Batya-batya and Sampaloc Falls. Suggestion: since there already is a dam, the untapped water power can be harnessed to generate electric power by building a micro-hydroelectric power plant. It can supply electricity to the resort, a source of clean, renewable energy, even to Pangil town to power up street lighting, for example, saves people's money. To be also more eco-friendly, why not educate people against the use of plastic bags/styropor inside the resort, not just on waste segregation. Pangil can also emulate the move of Paete to ban the use of plastic bags. the dam and spillway is a nice area to play around but danger lurks on the spillway canal where the outlet has no grills. Just one "faux pas" or a slip can result to serious injury or death. Pangil local government should construct grills at the mouth of the spillway to avoid accidents, don't wait for the day this warning becomes a reality. Flash floods can also occur anytime during rainy season, stay at the kiddie pool if there are vulnerable children with you in case there's heavy rain. parking area inside the resort. there are no restaurants but you can bring your own food. there's a sari-sari store inside plus vendors selling different stuff outside like fresh buko. From Taft Avenue near corner Gil Puyat (LRT Buendia station), ride a Green Star Express bus to Sta. Cruz, Laguna (or an HM Transport bus to Sta. Cruz, Laguna from EDSA, Cubao, Quezon City) (Bus fare fare is around PhP140.00). In Sta. Cruz (Pagsawitan or at the Jam bus terminal), transfer to a jeepney bound for Siniloan (jeepney fare is around PhP30.00), drop off in Pangil town then ride a tricycle to Piit (sitio Piit or barangay piit as how locals call the place). Alternate route via Rizal Province, ride Tanay-bound jeepneys at EDSA Central terminal. In Tanay, Rizal, transfer to a Siniloan-bound jeepney. In Siniloan public market, either take a jeepney bound to Sta. Cruz then a tricycle in Pangil or negotiate with a tricycle driver to take you there directly. You may also take a Raymond Transportation bus to Infanta/Real Quezon, drop off at the Siniloan/Famy junction on Manila East Road then take tricycle to Piit. If you have a GPS navigator, Piit resort is present on OpenStreetMap (added by Tutubi). The service road going to Piit is linked to Manila East Road, do not enter Siniloan nor Pangil town proper. There's a sign visible on the highway after passing the junction of Siniloan, Famy and Mabitac. love the cottages and the bridge. mukhang ang presko presko jan.
Wow! Hindi ko alam eto, sayang I used to visit the outskirts of Laguna from Sta Cruz to Siniloan every week because of work. Sana makabalik ako and visit this cool looking place sa Pangil, malamang malamig na malamig dyan. :) Thanks for sharing this! Wow, surprisingly prices are pretty reasonable! Maybe I can check this out during the long weekend! hi, i'm planning to go here alone for the long weekend. do you know if the small houses (200php rate) have locks? i'm planning to leave my things there when i intend to swim or such. I'll bring my dslr along din kasi. thanks so much! thank youfor sharing. I was planning on dito lang sa Villa Excellance with my boyfriend this thursday..
since ive read ur blog. i think dito na kami punta . hi just wanna know if theres a room for a overnight stay.thank you. how long is the travel time to this eco park from calamba? tnx! see you this coming weekends! iv'e been there it was very awesome the trek to ambon ambon falls was very very awesome you have to swim in a deep river to cross to the falls. I've been here 3 times already coz my boyfriend lives in a nearby town called famy laguna, but i haven't tried trekking to ambon ambon falls since u have to pay 6pax even if you are only less than 6 pax... this one of the places that i love in this small town, the place is very relaxing, it's just that it is not advisable to go here here during holyweek for it is too crowded that u really have to reserve a cottage a week or 2 prior to holy week.. so for those who want's to relax and feel the fauna of sierra madre, this is a place for you! I've been here 3 times already since my boyfriend lives in a nearby town called FAmy LAguna.. i haven't tried trekking to Ambon2 falls since it will really require you to pay 360 pesos which is good for 6 pax, even if you are only less than 6 pax.. on the other hand, even if I haven't been to that falls, i can really recommend this place for those people who wants to find time time to relax, unwind and enjoy the beauty of fauna of sierra madre. you can also enjoy taking photos if you're a photo addict! (just like me:-D), indeed this is a worthy place to visit! Just came here this Dec. 29'11.Thanks to TUTUBI for sharing your backpacking/budget travel experiences. The trekking to Ambon-Ambon falls was the highlight of the visit here. If not for trekking, the place is good for relaxing, family bonding, if you dont intend to swim in the river, like in our case it was too cold during this season. But i tried to dip my whole body in the cold fresh water for few minutes only. At first it was cold, but i cant believe that even if i was chilling, i really felt how refreshing it was to dip your body in the fresh water, despite the cold. I bet it will be more refreshing during summer. The trekking was fun & exciting though little dangerous for first timers like us esp when you bring your camera along the way, so dont forget to put it in a plastic pouch, and other valuables as well. The tour guides are well experienced. There was no room available to put your belongings, but they rent tents for P300 overnight, in our case we still rent one even just for day tour, just to secure our belongings at least, unlike in the cottages where your things are more exposed. Shower rooms/toilets are not properly maintained but we still manage to use it well. So, if you want to visit this for experience, you may be the judge. It's someway a less budget to compare with the experience you'll get. thanks for bloggers like you!...nakakasawa ang MALLS,thats why now and then im always looking for places here in Laguna especially places where we can camp out coz,i really love to spend a lot with nature as much as possible..:). Hi!! may plan kami pumunta, meron po ba kayo contact number para makapagtanong din po kami tungkol sa mga rooms or other information 'bout sa resort. thanks..
wow! ganda na ng "piit" dyan kami madalas maligo dati! sikat na sikat na ang ambon-ambon! maganda dyan mga sir/maam hindi kayo mag sisisi! ayoko na. may danger pala. i was born there and spend my childhood in pangil, even live in piit. 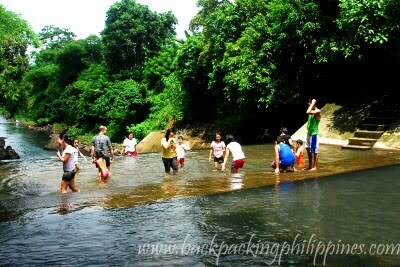 we used to swim at the spillway,thats quiet sometimes ago.and i cant believe how piit developed into a tourist spot..hope that despite the development its ecological value will still remain....Hope i can visit Pangil soon..
how much po ang bayad sa white water river tubing? I didn't see any picture of the cottages? Anyone has it and willing to share.. 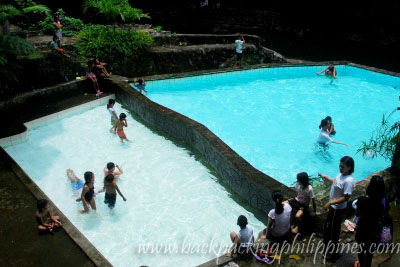 I am going to the Philippines in August 2012 and i want to see this place. Not too far from Calamba, i heard. Ano po schedule ng Ecopark? Is this open any day? We're planning to go there on First week of June e. reply po please? :) THANK YOUU. guide said that we will go to a falls, but before we got their there is a long journey. We walked 8-10mins. is that small houses you mean like private room to stay for an overnight? and how much po? Hi! Is it okay to sleep in the cottages if we go over night? In case we decide to camp, would you provide the tents or do you have tent rentals at least or should we bring our own? Thanks! Tangina @rigel kent. Wag ka na mag-English kahit kailan. Nice review, the park reminds me of enchanted river. It kinda look like a typical eco-park but still a good place to relax nonetheless. Hopefully today that spillway has grills now, or at least any safety fence or something. Thank you.